What would you do to save the one person that has been there for you since you were a kid? Would you pull off a dangerous heist? Go toe to toe with a man armed with a liquid nitrogen gun? Would you face your crazy ex-husband? If so, then you are a lot like Glory, the star of the new Image Comics series, Death or Glory. 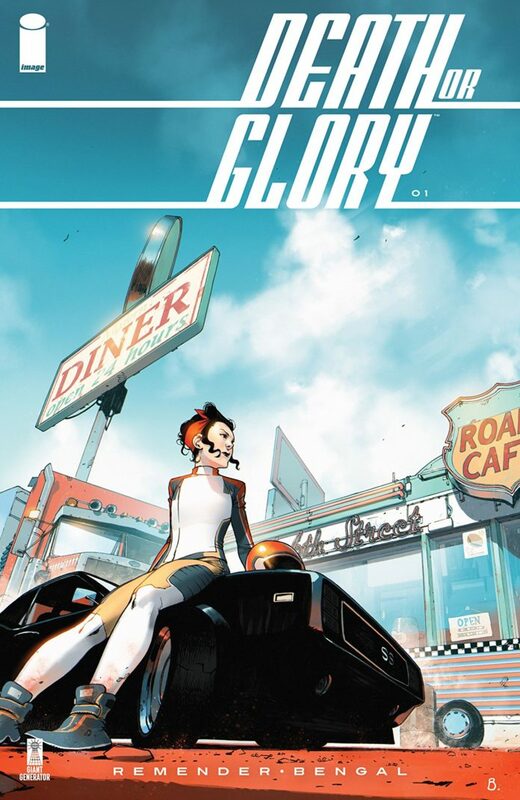 From Rick Remender (Tokyo Ghost, Sea of Red) and Bengal (Naja, Meka), the story is about Glory, a young lady skilled in mechanics and who was raised off the grid and away from the pitfalls of capitalism. When her father figure Red falls ill, it’s a hard situation as he too is off the grid. So how do you get medical attention when you don’t have insurance, you don’t really exist on paper anywhere? It falls to Glory to find the funds to save him, which includes intercepting some shady funds being transported for her crooked ex-husband. Of course, life doesn’t turn out as we plan, as Glory finds herself in a situation full of setbacks, danger, and a huge surprise at the end. Remender knows how to create memorable characters, and he does so in this debut issue as well. Not only do we want to see Glory succeed, we want to see what’s next for the disarmed man with the nitrogen gun, and see just how much of a scumbag Glory’s ex really is. The issue keeps its momentum the whole issue, with the foot on the gas as you hit the mid-way point. Bengal’s artwork is so fluid and vibrant, it’s a great fit for such a fast-paced tale. I’ve been a fan of Bengal since I saw his work that was published through Magnetic Press, and this book is another testament to his talent. Death or Glory sails past any doubts one might have had about this series. Remender and Bengal deliver a high-octane adventure that leaves us wondering what’s next. I highly recommend picking up the first issue, just make sure to buckle up. Next Star Trek The Next Generation Through the Mirror #1 Review: Attack of the Goatees!